Al Pacino was born in New York on April 25th, 1940. 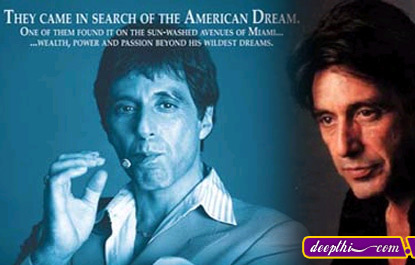 He was the only child of Salvatore and Rose Pacino, who divorced when young Alfredo was two. Combine the movies he went to with his mother with the natural bravado a young boy needed to survive in the Bronx and you have the perfect making of a natural performer. He appeared opposite James Earl Jones in The Peace Creeps and after a stint in Boston received rave reviews for his role of Murph in The Indian Wants the Bronx. His work earned him the Off-Broadway community's Obie for Best Actor for the '67-'68 season. The next year brought Pacino's Broadway debut and though Does the Tiger Wear a Necktie? only lasted 39 performances he again caught the attention of critics and peers and was awarded his first Tony Award. The young actor felt ready for a try at a film career. He played a junkie in his first film, 1969's Me, Natalie and again in 1971's The Panic in Needle Park. His performance in the latter film brought him to the attention of Francis Ford Coppola who, despite studio pressure, cast him as Michael Corleone in The Godfather. That performance netted him an Oscar� nomination for Best Supporting Actor. He followed that landmark performance with roles in Serpico, The Godfather, Part II (for which he received another Oscar� nomination) and Dog Day Afternoon. He even tried his hand at comedy in Author! Author!. Though he's had a few small stumbles (did anyone see Revolution?) he continued to toss out memorable performances in Scarface, Sea of Love and Frankie and Johnny. In 1977, Al won another Tony Award for his role in The Basic Training of Pavlo Hummel, a testament to the fact that his stage chops are still sharp as he always tries to schedule a play after each film. With no sign of slowing down, Pacino continued to provide great moments on screen. The 90's saw him perform in The Godfather, Part III, Glengarry Glen Ross, his Oscar�-winning turn in Scent of a Woman,Carlito's Way and Heat opposite Robert De Niro. He examined his love for Shakespeare in the documentray Looking for Richard and closed off the decade with Donnie Brasco, Devil's Advocate, The Insider (with Russell Crowe) and Oliver Stone's Any Given Sunday with Cameron Diaz.